Summer is so close we can pretty much taste it around here. We've been swimming after dinner, eating strawberries with every meal and trying our hardest to maintain reasonable bedtimes despite the sun and pool having other ideas. On that note, I thought I'd share a little bit about our summer plans. We haven't been heating the pool but that hasn't deterred the kids from jumping in and having a blast. They picked up right where they left off last year and I was pleasantly surprised with how much they remembered. They've been in the water the past four nights and their skills are already improving. I'm foreseeing A LOT of time in the pool this summer! The boys are going to Sky Ranch Launch camp, a basketball camp at school and Vacation Bible school in the evenings one week (Mason thinks he's HOT STUFF going to VBS at NIGHT!!!). Griffin is going to a preschool worship camp and a Vacation Bible School. 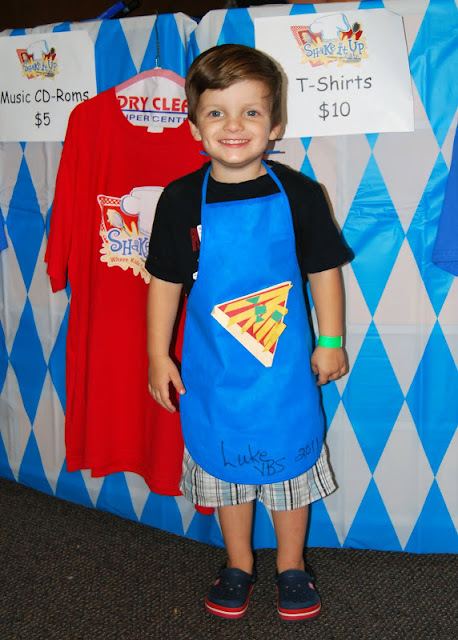 Can we talk about how PRECIOUS 3-year-old Luke was at VBS in 2011?!?!? We'll make a few trips to our favorites - the Perot Museum, the Dallas Arboretum and of course Playstreet and I really want to take them to the Natural History Museum in Fort Worth as well as the Dallas World Aquarium. Believe it or not we've never taken the kids to a water park (I know!!! ), but this is the summer for it! I've been missing Family Book Club and have some really fun ones planned for the kids this summer. This summer I'm working on plans for these books and am SO EXCITED for the Dragons Love Tacos 2 book! Dragons Love Tacos was our first Family Book Club day and I can't wait to work on another taco-themed day. I'm also working on putting together a few "themes" with activities and outings on topics that the boys are really interested in. So far I have outer space, animals and camping as themes. 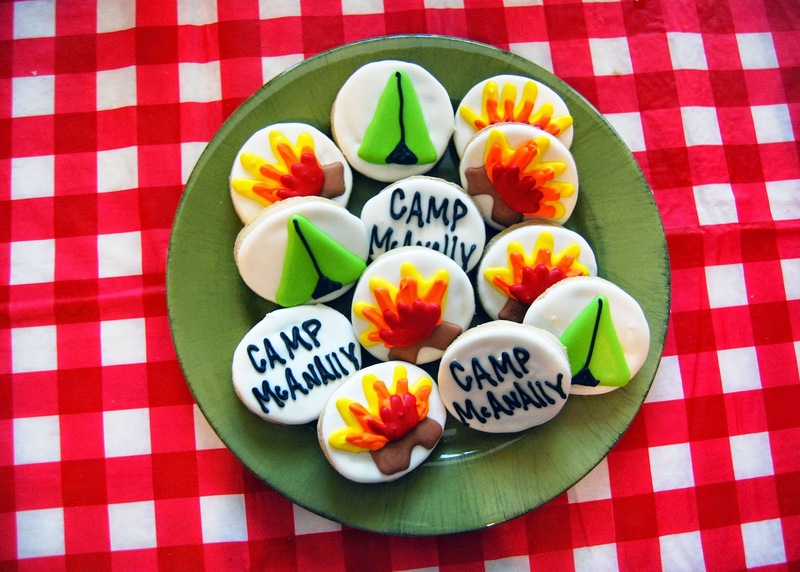 Cookies from our "Camp McAnally Day" a few years ago. Sidenote: some of you are twitchy just reading about these book club days and theme weeks.... please know that I LIVE for things like this. I love the planning, the creativity and the memories we make. If you're intimidated start small! Read the book over a special lunch and follow it up with a craft and you're good to go! I mentioned before that we're headed back to Vail and while our plans had to change slightly - the place where we were going to stay is going to be under construction so we had to cancel and rebook at a new location and on new dates - we're so excited about the new house and location! We're considering doing a trail ride with the kids - have any of y'all had experience doing that with a four and six year old??? While we do love to be on-the-go, I'm going to purposefully make time for rest and reading in our days this summer. I want the kids to love reading and I think it's so important for them to see me loving it as well. I tend to have a hard time making the time to sit down and read during the day because there's laundry to be folded or dinner to be prepped - but I'm really hoping that 45 minutes of everyone piled up on the couch or out on the patio with a stack of books will be a favorite part of everyone's day. This is something that Dave and I don't do very often during the school year, so we're making a point to get out together during the summer. Without sports practices, papers to grade and school the next day for the kids we have a lot more flexibility to get out. So... what are your plans for the summer?!?! Staying in town? Going on a fabulous trip? Crafts and activities? Swimming all day every day? I'd love to hear! I've done your Family Book Clubs with my kids and we all LOVE them! Can't wait to see the new ones! My 5 year old came up with the idea to learn about different countries this summer. Each week she wants us to pick a different country and have a food from the country, make a craft, learn a few words in the language, read about it, etc. I think it will be so fun for all of us and I love that the idea was completely hers! Can't wait to hear about Family Book Club!! These are my favorite!! Girl your summer sounds soooo fun. It really cannot get here fast enough!! I love all of you ideas. You guys need to try out the ninja warrior place by you guys we went last summer and my kids had a blast. I did not realize McKinney was so far from us so I made them stay the whole 2 hours and were worn out. I took a group between the ages of 5-12. Everyone loved it. We have also done trail rides in Colorado when my daughter was 4 and 5. She LOVES horses so it was fun for her. But to be honest there sooooo many other fun things to do and waaaay less expensive and it's something you could do here. I personally would not recommend It. Sounds like a great summer!! Woohoo! I love the idea of reading time! I agree it's so important for our kids to see us reading and I like the idea of snuggling up with my six year old for this while his baby sister naps! Your themed book days are always inspiring too! I adore your Family Book Club idea and can't wait to start this with my son! We just starting reading the Flat Stanley books so we may start our book club with those. We are planning on camping out in the yard, beach trip, fishing, a night at the drive in movie theater and lots of crafts,outdoor fun and trips to the library! Can I just say, I am so grateful for your Family Book Clubs. I am a former primary teacher (and still very much so at heart) who lives for these types of things myself, but with a husband who works a lot and a baby at home, it doesn't leave me much time to be original. Using some of your ideas makes it easy and my oldest LOVES waking up to the surprise. He still talks about the few we did last summer!! I can't wait to see what you do! I had already bought Dragon's Love Tacos 2, the rest are in my cart! Thank you! I loved this post. It gets me excited for summer break. As a teacher, I am feeling the crunch and stress of the end of the year and need the last few weeks to get everything done, but I am really looking forward to spending time with my family. We make reading a huge deal in the summer. I sign my kids up through our library's summer reading program and they love it. They get special prizes each week and they have great hands-on exhibits each week with a new theme. Have a great day and I hope this last week isn't too stressful. I love your summer plans! I have done several of your book club ideas with my grandchildren and now they "expect" Mimi to bring a book, a craft and a movie whenever I stay with them:). My favorite memories are of when my kiddos were the ages of yours and I still had control of the schedule:). Enjoy! I am home this summer on mat leave and I'm excited to do some of these activities with my five year old. Thanks for sharing these again! This is our last summer before Elle goes to Kindergarten. I work full time 4 days a week, so our plan is to squeeze in as much fun as we can on the weekends. And (shhhh... dont tell my boss) take a few sick days for extra fun during the week. I'm definitely going to do a few Family Book Club activities, too. Library, cat shelter visit, tie dying, pottery painting, swimming lessons, hip hop dance class... and really just some time to soak up my big girl before she gets EVEN BIGGER! My last day of teaching is next Friday, but as senior class sponsor (my favorite part of the job), I still have graduation things to finish up. I'm looking forward to sleeping in, long walks, gardening, pool time and date nights with my hubster. Our children are grown, so I'll be home alone...LOL I'll be still working my second job as a waitress at a country club, but it's much less stressful and I love socializing with my customers. Your summer looks packed full of fun! What a small world...I know a young lady who will be working her first summer as a Sky Ranch camp counselor. I have no idea how big it is, but her name is Alexa Hynes. She was one of the girls I taught and helped disciple at church, and is super sweet and so great with kids of all ages. Look her up and tell her hi from me! We did a trail ride in San Antonio a few years ago when my kids were 2.5 and 5 and they LOVED it. My youngest rode with my husband and my son was able to ride the horse alone. It was a great experience and we have gone on a couple more in the years since because they enjoy the ride so much. Griffin could ride with either you or Dave if you want to take extra precaution but Mason should be good to go on the horse by himself. Have fun! I've always loved your book club days! I don't have the summers off but I'm determined to make our summer evenings as fun as possible! What a fun list! I cannot wait for summer fun and relaxing either!!! Don't forget about that unicorn pool toy Griffen got for her birthday! I took my barely 6 year old on a trail ride last year and at first he was very hesitant because he had to be on his own horse but he LOVED it. He talked our guide's ear off the whole 2 hour ride! I love to see your book club days! They are so cute and give me lots of ideas! I love a list like this and it's inspired me to make a quick list for my family as well. It's good to get those plans down on paper. I absolutely LOVE your family book clubs and theme weeks! Being a teacher myself, it makes me so giddy to see you reading to your kids, having them read and letting them watch you read!! I wish all parents did that!! My mom was always a working mom but one year she transitioned between careers and took a year off as we were entering middle school to spend time with us. my sister and I were in middle school but she had us read for 1 hour a day and she always read too! Then she would ask us what our books were about! I'm 27 now and my mom passed away a few years ago but I have such fond memories of that summer and she didn't nearly plan as many things for us as you do. But I remember reading with her on our back porch every morning for 1 hour! Mason thinks he's HOT STUFF going to VBS at NIGHT!!! <-- Done! That's all I needed to read to make my day!